The Chester County Planning Commission launched a Landscapes3 photo contest at noon Monday, Aug. 28 to highlight the county’s greatest asset: people. The Planning Commission is seeking photos of people who live, work, visit, or play in Chester County. The photos can focus on people in different settings, including businesses, homes, downtowns, public community events, and outdoors, among others. 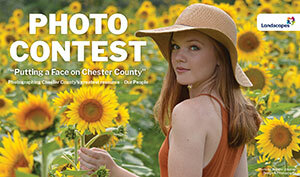 The contest, “Putting a Face on Chester County,” ends at noon Friday, Oct. 13. To view the rules and submit a photo, click here. Anyone who submits a photo early will be entered into a random drawing for two tickets to Natural Lands’ Roots & Bluestems event. The deadline to submit a photo for this early prize is 5 p.m. Tuesday, Sept. 5. This photo contest would not be possible without the generous support of Natural Lands and our other sponsors: Longwood Gardens, Brandywine River Museum and Millstone Café, Dansko, Trek Bicycles (Exton), The American Helicopter Museum, and the Palace Bowling and Entertainment Center. Prizes from these other partners will be awarded to the selected winners in the adult and youth categories. i entered your last photo contest.You took forever to pick winners and then made it extremely difficult to find the winners. What are your plans to improve this? -Contest opens August 28 and will end October 13, 2017; finalists TBD by October 20, 2017; contact all that have participated and announcing results on our website on or about October 30, 2017. We do recommend that you follow the contest rules of submitting photos which include a model release form. The photos that have been submitted for this contest are online and can be found by clicking the link on our website where you would click to submit a photo. http://news.chescoplanning.org/calling-all-photographers-to-participate-in-photo-contest/. Do you accept work by professional photographers? We do not have any restrictions for professional photographers submitting photos. Thank you for asking and good luck!